Searching for the key to save a world beyond hope. 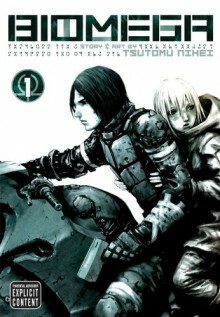 Tsutomu Nihei's zombie sci-fi horror epic!R to L (Japanese Style). Searching for the key to save a world beyond hope. Tsutomu Nihei's sci-fi horror epic! Zoichi Kanoe plunges into the depths of 9JO-an island city in themiddle of the Pacific Ocean-in search of Eon Green, a girl with the power to transmute the N5S virus. He's not the only one looking for her, though… Agents of the Public Health Service's Compulsory Execution Unit are also in hot pursuit. Zoichi and his transhuman allies have no time to waste; the countdown to the zombie apocalypse has begun!! Der Inhalt klingt eigentlich spannend und den Zeichenstil fand ich nicht schlecht, aber mir war es zu wenig Text, zu wenige Dialoge, daher konnte ich mich mit dem ganzen leider einfach nicht anfreunden. Beautiful, beautiful art. Over the top story... but I definitely want more!